With so many different approaches to self care, wellness, and spirituality at our fingertips, how do we know what works? One of our favorite ways to learn about new practices is, of course, to see what our friends are doing, and how it’s working for them. That’s what Radiance + Ritual is all about. Radiance + Ritual is an interview series that takes a deeper look at individuals in our community who are living in their glow—what wellness rituals they practice, what self-care looks like to them, and what routines help them achieve their best self. Lauren Nowell is a recipe developer, detox specialist, natural health advocate, and a long time Instagram crush of ours. Since her line of work is focused on healing with food, we're calling this our Skin Food edition. She shares amazing recipes and incredibly valuable information on healing naturally, so we are beyond excited to share her message on Radiance + Ritual today. introduce yourself! who are you, what do you do for a living, for fun? I'm Lauren Nowell, a former Textile Designer who left the NYC corporate world to pursue sharing the message of natural healing through diet and detoxification. I currently run an inspirational Health & Wellness page on Instagram called @greenleanbean where I share my journey about how I healed myself and inspire others to gain their health back with diet, herbs and different detox modalities. At home, I maintain a big garden where I grow my own food, I’m a recipe creator who loves being in the kitchen creating healthy meals, I run an Etsy Shop called Moonlit Botanicals, and I am a Detoxification Specialist who offers coaching services for those trying to regain health. I am also working on many other fun projects that will be launched soon (such as a new website!). how did your passion for skin health start? My passion for skin health started when I was diagnosed with several melanomas, which was just one health concern I was battling amongst many at the time. After not seeing any positive results come from treatment and surgery, I realized that it was time to turn inward and start looking for answers from myself & from nature. I awakened to the idea that our food has everything to do with how we feel and I began to see how disconnected from nature I was. Not understanding or giving thought to what I was feeding my body or what I was putting on my skin, I realized that these are crucial components to our health. My skin cancer was the catalyst for change in me. Since the age of two I was suffering from Crohn’s Disease, arthritis and later came lyme, asthma, candida and skin cancer. I reached my breaking point. I couldn’t keep adding onto the list of ailments and the side effects that came from all the medication I was put on. It was obvious the path of medications, surgeries and treatments I was on was leading me down a dead end road. I began researching natural healing and discovered regenerative detoxification, raw food and herbal botanicals. I slowly started eliminating fish, eggs, meat, and dairy, all while increasing my intake of fruits and vegetables. I was in a desperate position to feel better so I moved quickly into a high raw diet with an emphasis on eating mainly fruits. Within weeks, I started to notice my daily pain decrease and over time my symptoms started slowly falling to the wayside one by one. I got off all my medication, my chronic inflammation started to go down and I soon was able to do things I had never done before because my health & vitality was increasing. That was 7 years ago and today I can proudly say I am completely free from all the chronic dis-eases I was suffering with. Even though I feel amazing and display no symptoms, I am a firm believer that there is no end to healing, as this new way of living and eating is more so a lifestyle I have adapted and there is always space in which I hold for deeper healing. What kind of meals did you eat growing up? I grew up eating a lot of animal products, processed food, fast food, candy, ice tea and soda. I was a sweets person, loved eating baked goods, loved eggs and breakfast meats. I was a total cheese-aholic, my favorite meal was grilled steak and I ate more pizza and cheese fries than anyone I know. My mom was and still is the most amazing cook, so we had loving home cooked meals put on the table almost every day. But as I look back, no matter how much love went into it, it was just not the right chemistry to be putting in my body. Suffering with chronic illness and always being malnourished and skinny, I was urged by my doctors to eat meat, dairy, fast food and all types of fattening foods in attempts to gain weight. I never made the connection to my food and my suffering because I put so much trust in the specialists who were guiding me and my parents. As we look back, we are horrified at the diet they pushed on me at the time. All the wrong chemistry for my poor body that was trying to fight inflammation, and instead I was being told to eat things that fed inflammation. What does your general diet look like now? Today, I practice a strong maintenance program which helps keep my health in check and my vitality levels high. This involves keeping my lymphatic system circulating, my elimination channel flowing, keeping my body within base chemistry by consuming alkalizing foods, feeding and breeding healthy gut flora and bringing in plenty of plant based nutrition. I call it the hydration, alkalization, and elimination maintenance program. We must keep waste out, keep our channels of elimination open and flowing and provide our body with the fuel and hydration it needs to run properly. My food intake changes from day to day, as I am a very intuitive eater and I follow inner guidance to direct me to what my body needs or is desiring. The cleaner you are, the more of a strong connection you will make with your inner guidance system. Cleaning out waste seems to electrify the connectivity of the brain-gut connection so our needs can easily be heard and met with informed and connected self-loving decisions. A typical day for me starts with hydration and alkalization, always. My motto is “Fruit First”. Whether it be a tall mason jar of warm lemon water, a fresh squeezed orange juice (I LOVE orange juice! ), a fruit smoothie or a big mono-meal of fruit. I used to drink coffee, but after learning how acidic, stimulating and taxing that can be on our adrenals, I switched over to herbal hot tonics. There are so many healthier alternatives out there these days! Rather then starting the day with a dehydrating beverage, a better choice is more of an alkalizing drink such as Dandy Blend, Yerba Matte, Turmeric Latte, or a medicinal herbal tea! My favorite is Yerba Matte with Superfeast Mushroom blends added. They have an amazing Beauty Blend great for glowing skin! Somedays when I am busy and want to feel energized and light, I will Intermittent Fast till 1pm-2pm then start with fruit and have a light raw meal at night. For lunch you can typically find me eating more fruit, whether it be a bowl of naval oranges, a giant smoothie, or another fresh juice depending on my appetite. Somedays if I’m feeling more savory, I will enjoy a salad, cucumber slices with a dip or cucumber sandwiches (I like to smear Miyoko’s vegan cheese in-between two cucumber slices with a little sprinkle of sea salt/pepper and lemon juice) or raw veggie wraps (I love Nuco coconut wraps). For dinner I tend to eat more heavier grounding meals. Some of my favorites are a giant family size salad loaded with tomatoes, cucumbers, peppers, sprouts, scallions, pumpkin seeds, my homemade coconut bacon, drizzled with a creamy tahini dressing (sometimes I add freshly cooked quinoa or brown rice over top); a giant loaded veggie sammie (lettuce, tomato, onions, pickles, peppers, avocado, cucumbers, vegan mayo, my homemade coconut bacon, red wine vinegar and Italian seasoning on toasted organic sourdough bread) or a nice wholesome meal of potatoes and steamed veggies with a small side salad. I am a soup/stew fanatic too and always am making batches of soup, even in the heat of the summer. Soup and salad are one of my favorite dinners! Do you see a change in your health/skin because of how you eat now? Eliminating all animal products from my diet and returning back to nature has been a life-changing decision. It was exactly what my body needed in order to heal. At first I did it strictly for health reasons and eventually it organically transformed into ethical reasons. My health is vibrant, my skin is glowing, I am more connected, more spiritual, more rooted into Nature, I am full of gratitude and respect for Mother Earth, the healing plants that she provides us with and the animals that reside here with us, not for us. I truly believe that in order to feel life, we must eat life. Vibrant life-giving foods that come from the Earth, in their whole and brilliant form, foods from the garden, not from the grave. Switching over to a diet of nutritionally dense, hydrating foods along with herbal botanicals not only eliminated my pain and chronic inflammation, but it helped my skin in so many ways. What we put inside is vital to what reflects on the outside. Connecting back to nature was the missing element in my life and I am so happy to have returned. It is our birthright to feel free, to feel alive. We are not meant to feel weighed down, in pain, taxed, tired or stressed. We all have the ability to rise up and feel our best. It takes some dedication, will-power and change but it will be so worth it! I am so grateful for suffering all those years because I would have not felt the freedom if I had not felt the weight. I am confident in knowing that I had to go through the suffering so I can fully understand what people are going though in order to help them find their health. For that, I am thankful. Do you have any foods you credit for your skin health? Yes! Foods that naturally cleanse and hydrate from within! We all know how important it is to hydrate ourselves and usually the first thing that we think of to hydrate is to drink water. How about eating our hydration? That is why I am a big proponent of all fruit because it is both cleansing and hydrating. I truly believe we need to clean our insides out regularly and fruit not only cleanses our tissues but it also hydrates and feeds our cells. I am a huge fan of water-rich fruits such as melon and cucumbers. I eat at least 1-2 cucumbers a day. They contain silica and lots of water which is great for skin health! Juicing straight cucumbers is a great skin juice! I love consuming fresh aloe for glowing skin as well. I cut out a 2” section of a fresh leaf and filet the gel out from inside, add it to my Vitamix with coconut water and frozen pineapple. Aloe is a super potent anti-inflammatory, anti-viral, anti-bacterial and great for gut health. When finished filleting the aloe leaf, you can rub the remaining gel left in leaf all over body and face for a cooling and hydrating treatment! Papaya is also another healthy skin food that I absolutely love sprinkled with lots of lime juice. It is not only super healing for the gut (which plays a very important role in skin health!) but the vitamin C in papaya helps fight off free radicals that damage the skin’s collagen and elastin. I recommend of course eating it but a wonderful face mask can be made as well with mashed papaya and raw honey that will help soften, hydrate and create a beautiful glow. Another amazing source for silica & collagen is irish sea moss. I use fresh irish sea moss that I clean, soak, rinse and blend to make a plant based gelatin that I add to smoothies or make cheeses and desserts with. Another natural source and the greatest source of silica is surprisingly bamboo because it has the highest absorbability. I personally use Markus Rothkranz's Wild Green Force (bamboo is main ingredient) + his Vitamin C powder which contain the highest quality plant based sources that are beneficial for skin health. I’m always advocating getting nutrients from real foods in their whole form but if you are looking for a concentrated whole foods based powder to compliment a healthy diet, then I can’t recommend these enough. Blend these products up with fresh aloe, papaya and cucumber and you have yourself a powerful skin tonic that the body will absorb and utilize! What are the worst foods for your skin? I think anything that lowers our energetic vibration, causes dehydration, stagnation and oxidation. Animal products and processed foods (this is includes processed sugar) I think are my top two worst foods for skin health and whole body health. Foreign protein (animal flesh), foreign hormones (dairy & eggs), anything boxed, denatured, dyed, preserved, chemically altered or genetically modified are things our bodies cannot recognize, fully breakdown or utilize. They create obstructions and are extremely low in angstrom energy (electromagnetic energy measured in foods) and form a low vibrational energy within us. When we eat foods straight from nature without cooking and processing them they hold a high electromagnetic energy that is transferred to our cells which is called biological transmutation. We need roughly 6000-7000 angstroms and systematic energy at all times to function on a healthy scale. Cancer patients have an average of 4875. Raw fruits have 8000-10,000, raw vegetables have 8000-9000, cooked vegetables 4000-6500, cheese is 1800, refined white flour is 1500 and cooked meat has 0 and in fact robs us of energy. The law of physics dictates that the lower energy of food you eat, the lower our systematic energy becomes. That is why I feel my best eating a diet of high-vibrational, high energy raw foods verses too much cooked and processed. My balance is 85% raw and 15% whole foods plant based cooked. For me to glow and exude life on the outside, I must feed myself life on the inside! Share your philosophy for radiant glowing skin with us? Healthy skin starts from within! The healthiest recipe for good skin is a whole body approach. Diet plays such an important role. We need to start connecting to our food in a more loving and respectful way and making better choices to what we are feeding our bodies. We often eat to satisfy hunger or cravings or eat for comfort and reach for what we love and grew up with and tend to disregard what chemistry we are putting in and most importantly what it is leaving behind. What we don’t eliminate, we accumulate. Many of the foods we are eating as a culture are accumulating in our tissues because they are so far from Nature and our bodies can’t fully break unnatural foods down to be eliminated. 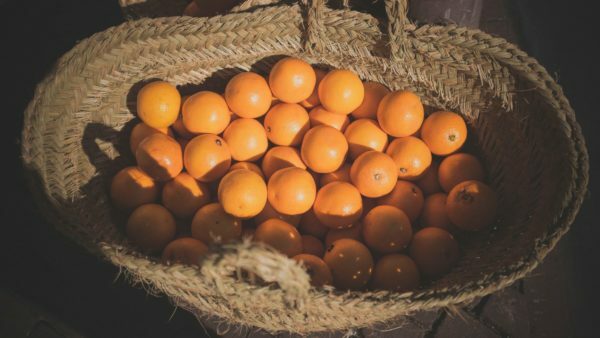 If it is creating an acidic environment within, leaving behind residual waste, creating oxidation and inflammation, dehydrating us or feeding and breeding bad bacteria, it’s most likely not the best thing for our body. If we want to have our outward appearance be healthy and glowing, we must first start cleaning up our environment and terrain inside. This is why I am so passionate about regenerative detoxification. Detox is a way to eliminate waste, microbes, toxins and chemicals that may be embedded in our tissues and causing imbalances, harboring dis-ease and effecting our immune system, our nervous system and our endocrine system. This is a great place to start to sustain healthy skin. Anything with a great source of dietary fiber is amazing for skin health. Fiber absorbs toxins in the colon and eliminates them from the body through bowel movement. Plant fiber also helps feed and breed healthy gut flora which creates our Immunity. 75% of our lymphatic waste is dumped into our colon so keeping this area clean is very important to overall health. I maintain the health of this area with periodic colon hydrotherapy sessions and annual parasite cleanses. We de-worm our pets but never do we address ourselves. We all have them to some degree and it is important to make sure it never turns into an overgrowth which can really have an effect on the functions of our body. If we clean and maintain our internal terrain, microbes won’t harbor and proliferate and become a problem but if we keep feeding them what they love, they will always be there to clean up the waste being created from the wrong foods we are consuming. Just as in Nature, flies come to breakdown something dead, just as microbes inside of us are there acting as our garbage men. If we are feeding ourselves life-less animal foods, then it will put out a welcome mat for microbes to come and live off our cellular waste. Another thing that plays a major role in skin-health is the liver and it’s so important to detox the liver and maintain a clean diet to keep waste out of this vital organ. I am a firm believer in a whole body approach and I don’t find it is helpful to isolate our problems. Everything is connected within and it is so important to focus our attention on the body as a whole. 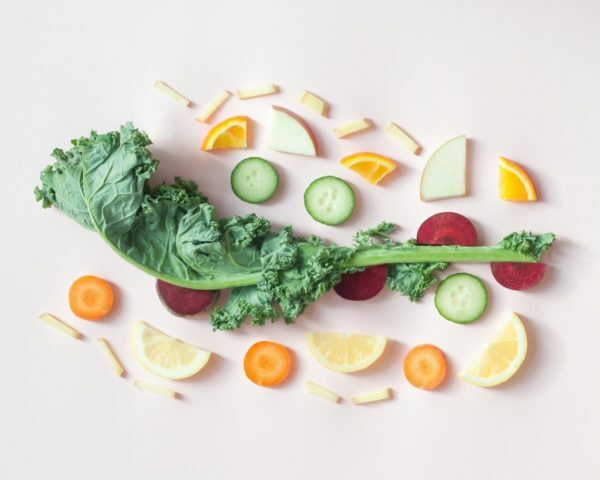 Bringing in balance through diet is always number one, second is to keep our elimination channels open and keeping our lymphatic system flowing. Whether this be through light exercise such as walking, rebounding, yoga or swimming or keeping the skin channel open through sweating. My favorite detox tool that I invested in was my portable sauna to open up my pores to eliminate toxins. I skin-brush before hand and follow my sweat session with an alternating hot-cold shower. Other top skin allies I use are herbal botanicals in the form of tissue specific formulas, high quality hemp oil, medicinal teas, my jade gua sha tool and of course my favorite line of skincare products by Annmarie! What we put ON our skin is just as important as what we put IN our skin. I stay away from products that have chemicals or toxins of any kind and only feed my skin pure food. My skin absolutely loves Annmarie products and it’s the only line I now use! What's currently your favorite go-to dish for healthy skin? Cucumbers are my favorite skin food. I can’t get enough, especially when they are abundantly growing in my garden! I like to get creative and I love eating simple and bright colorful food. 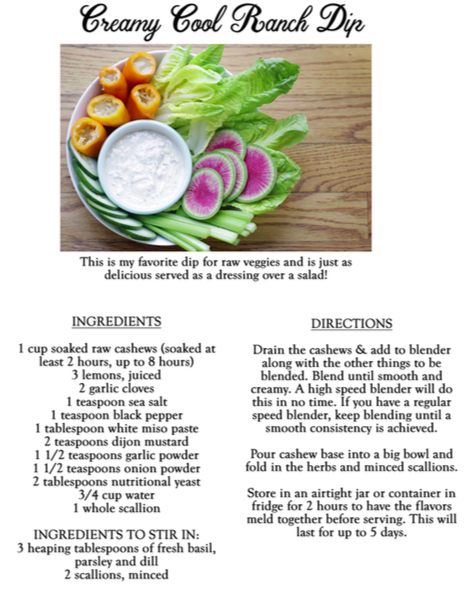 This dish makes a great meal or appetizer for guests. I recommend english cucumbers because they have less seeds then other varieties but I have successfully used regular cucumbers too. Look for the biggest ones you can find! Veggies of your choice- sprouts, peppers, the options are endless! 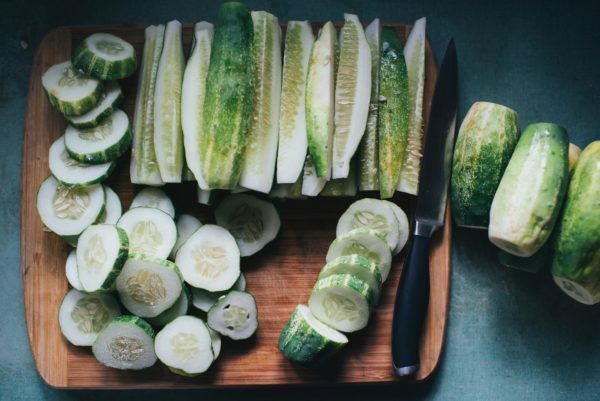 Start by slicing 1- 1.5” sections of your cucumbers. Holding a section in one hand, use a small spoon with the other hand to gently scoop and hollow out a little cavity, making sure not to dig too deep and cut through. You want just a nice shallow hole, big enough to fill with a little dollop of dressing and a few toppings. Arrange cucumber cups onto a platter or cutting board and get ready to fill each cup with your favorite sprouts, chopped veggies, dressing, hummus or guacamole. I like laying down some sprouts first, then I spoon in my filling. I then sprinkle vegetables chopped fine like confetti on top of the filling. Fresh herbs are a great pop of flavor too! I sprinkle with sea salt, cracked black pepper and squeeze fresh lemon or lime juice over top. Pictured here are two varieties of cucumber cups. One is filled with broccoli sprouts (you can do alfalfa) a creamy cashew ranch dressing, chives, cherry tomato slices and a sprig of fresh dill. 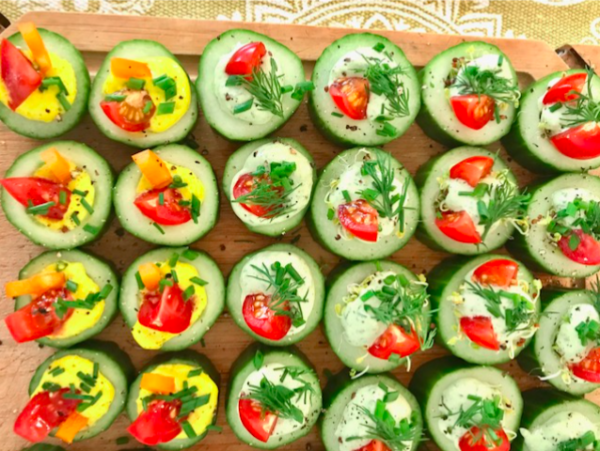 The other cucumber cups are filled with vibrant lemony turmeric tahini dressing, topped with orange pepper, tomato and chives. The possibilities are endless but these combinations work great! 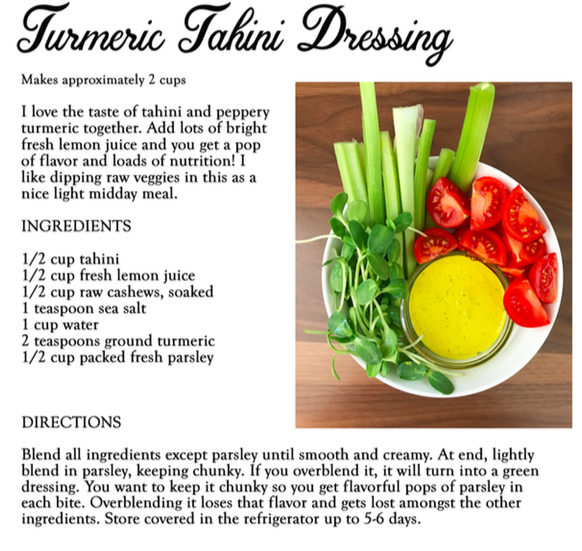 Here are the dressing recipes below. I hope you love them if you make them! Much love and gratitude to Lauren for sharing her wisdom with us. Follow her on Instagram here. Did any of Lauren's practices especially resonate with you? Share in the comments below!